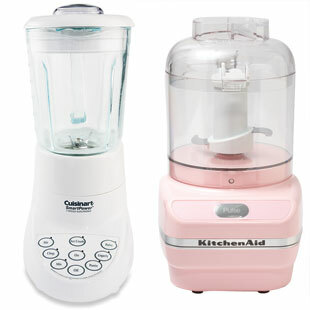 Food processor vs. blender: Which is the better kitchen tool? I function in an incredibly small kitchen. My constant challenge is finding room for what I really need and getting rid of what I don’t. The other day, I pulled out my blender and my food processor and thought that, maybe, I could lose one. Best For: My food processor takes over when my knife just doesn’t do the trick. When it’s not critical that my ingredients are evenly cut, I like to chop vegetables like mushrooms, carrots or onions, for example, into tiny little bits by pulsing them in my food processor to use in soup or as a filler in meatloaf. That’s something that my blender would have a hard time with. And it has interchangeable blades—one for grating and even one for making dough for pies or pizza. But what I really like it for: frozen desserts. Turns out you don’t need an ice cream maker to make a delicious frozen dessert. (Good news for a gadget-phobe like myself.) Chop up frozen fruit in your food processor and add a small amount of sugar or fruit juice to sweeten it up. Add some yogurt and you have instant frozen yogurt. Pour the mixture into popsicle molds and you have a healthy after-school treat. Not So Great For: Leave the liquids to the blender. Although a small amount of liquid is OK, the deceptively large bowl of the food processor cannot be filled to the top. Any amount of liquid that covers the entire blade piece can (and will) leak out through the middle, making a huge mess. Tip for Success: To get the most even chop from your food processor, you may have to scrape down the sides of the bowl now and then to reincorporate larger chunks of food that can’t be reached by the blade. Not So Great For: Anything solid in the blender can be a challenge. It really needs liquid to work efficiently. The tiny blade whips up air pockets around itself and the narrow shape makes it hard for solid food to make contact with the blade. So you can leave your veggies and frozen fruits to the food processor. If you’re making a smoothie using frozen fruit, make sure to use liquid, such as milk or even yogurt, to puree properly. Tip for Success: There’s a removable piece in the middle of the blender top. Remove it and place a folded kitchen towel over the hole when pureeing hot liquids to avoid a steam-generated explosion and possible very bad burns.